Incompetence goes viral in Romans 1 America…and yes, it’s okay to notice. 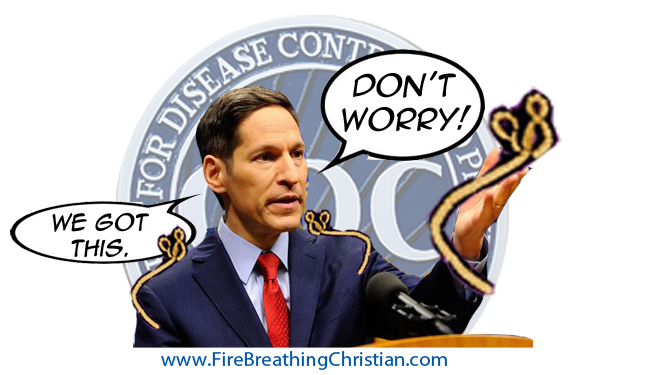 How can the CDC be so incompetent? How can Obama fail to stop Air Ebola from rolling in from Africa? How can State Governors just sort of wait and watch it all happen? The answer to all of this is: Romans 1. Or, put another way, it’s our fault. More specifically, it’s the professing church in America’s fault. We have earned this leadership, these systems, and every figurative and literal plague that has come our way. Wicked and wickedly incompetent leadership is the judgment of God upon us. Contrary to popular fluff religionists and worshippers of those crowned the title “expert”, not only is it okay to notice the tragically comedic hurricane of catastrophic error that is even now washing upon our shores, it s actually very important that we do so. As we’ve covered a few times here out of necessity in recent weeks, four means by which proud, rebellious people have frequently been judged by God throughout history are: Pestilence, drought/famine, wicked leadership, and by the sword of an enemy raised up against them. If we as Christians actually believe these words – and we must – then the sheer idiocy and foolishness enveloping us by way of the wicked leadership that we have freely, happily enabled and empowered as a rebellious people should be anything but surprising to us. We have proudly proclaimed and globally championed for generations now the virtue of religious pluralism – the worship of any god in our land – in open violation of the one true God’s First of the Ten Commandments. And just how brazenly do we embrace this flagrant demonstration of rebellion? By sprinkling monuments and posters and plaques to the very same Ten Commandments like so many lucky rabbits’ feet across the countryside while, at the same time, utterly dismissing out of have the first and foundational Commandment on those monuments, posters, and plaques: That we tolerate no other gods in His sight. We proudly and quite happily send off our children to State-controlled “education” systems – systems clearly advocated in and attached to three of the ten planks of the Communist Manifesto. We do this in direct opposition to His crystal clear command to make His nature the centerpiece of every subject considered in every moment of every day in the lives of our children, so that as adults they may be grounded and advance His Kingdom (as per the Great Commission kin Mattew 28) instead of “falling away” at a rate of 78-90% by way of secular programming through a lifetime of secular, Christ-dismissing “education” and worldview formation. We celebrate and sacrifice everything to enable and perpetuate an economic system built on the abomination (see: Proverbs 11:1) of fiat currency (think: Monopoly money). This system purposefully allows a few to crate “currency” out of thin air and then use its power to purchase and control everyone and everything beneath them. We happily play along and enable the fiat chains that bind us, by running faster and sacrificing everything to get just a little bit more of the “money”…that those at the top of this abominable system crafted effortlessly out of thin air. We do all of these things freely and happily, for the most part, because our worldviews have been formed much, much more by the State-controlled “education” system and corporate-programmed pop culture than we have by Scripture. And then we’re surprised by the state of affairs in America. Who do we think we’re fooling with this? Certainly not the God who has commanded that His people educate their children with Him as the explicit core and centerpiece of every subject. Not the God who has commanded that His people tolerate no other god or the worship of any other god in the land. And not the God who has commanded that a fair standard be the basis for economics and business as the necessary foundation of biblical property rights and a sound work ethic. Of all of the idiocy on display, it seems at least arguable that the worst of it is even now rolling off the tongues of tens of millions of professing Christians in America who are wondering “how it came to this”, complaining about “those Democrats/Liberals/Progressives” and looking…AGAIN(! )…to their favored secular idols for solutions. How many republican governors have even made a serious effort to seal their state’s borders? And where is George Bush? Either one? Don’t they live in Texas? Our Christ-dismissing, self-described “conservative” leadership is just as much the judgment of God upon us as is any other one of the figurative and literal plagues now afflicting us. This is the judgment of God upon a people on full, open, and very sad display. And we are here because we – the professing church – has led this culture to this place. We earn the judgment of wicked and incompetent leadership through our rejection of Christ as King. The question that stares and begs from this smoldering pile of building consequence is this: Are we any closer to repentance? Are we now finally on the verge of being broken to the point of admitting our rebellion, repudiating it, and turning to Christ the King as our actual standard in all things right here and right now? As I reminded readers (and myself) last week: Judgment begins with the Church…not the Democrats. It is not necessarily rude or wrong to laugh at some of the “if you don’t laugh you’ll cry” displays that seem to pop up by the minute these days as the judgment of God pours down upon us through, in part, the idiotic acts of wicked leaders (and wicked citizens). It is not sinful or hyper-critical to make sound judgments and reasonable criticisms. And it is not inherently mean or unloving to make note of incompetance, especially when the incompetence in question is about to kill you. But it is quite literally insane to do any of these things in our present context without also proclaiming and personally seeking repentance and restoration through the Gospel and Great Commission of Christ the King. As fear goes viral, Christians should calmly embrace reality and prepare. Right now. Of course Ebola is airborne. It flies in from Africa all the time. The Obacalypse continues…but are we any closer to repentance? Want relief from the stress, fear, and anxiety of Ebola, ISIS, and Obama? Focus on Christ the King. What does the Gospel and Great Commission have to do with Ebola? Ebola? Don’t worry. The “trained professionals” have it, like, totally under control, and stuff.